Too often, the life of a cotton garment, whether it's conventional or organic, ends at the landfill. Growing, spinning and weaving leads to cutting and construction and that leads to consumer use which eventually can lead to the dump. Factoring organic farming practices into the equation is certainly preferable to industrial agriculture, but farming still uses a lot of water and leaves a carbon footprint from preparing the soil, cultivation and harvest. Thanks to a partnership with the TAL Group, one of the larger garment manufacturers in the world, we have been able to take cotton consumption and twist it closer to the elusive closed—loop. 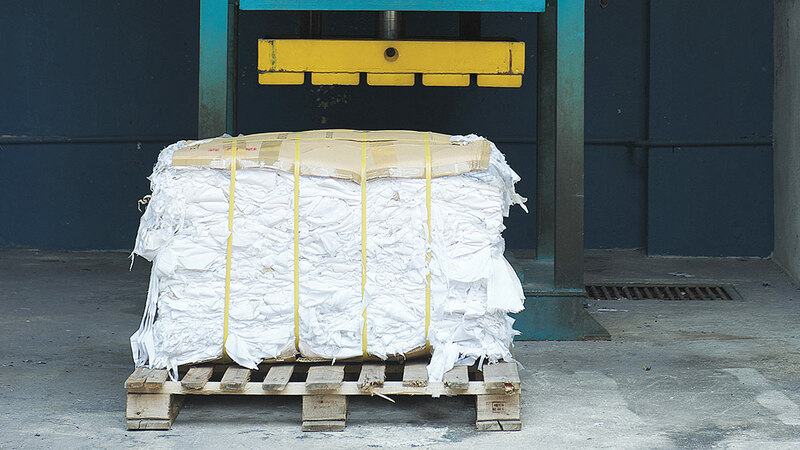 Since 2011, the TAL Group has been saving their cotton scraps by sweeping the floors of their factories in China and Malaysia—saving hundreds of tons of useable cotton in the process. This cutting-room scrap is then spun into fully functional fabrics. Basically, the leftovers from 16 virgin cotton shirts can be turned into one reclaimed cotton shirt. When you consider the volume of work being done at the TAL Group's facilities, it adds up to a lot of saved resources. Reclaimed cotton is neither bleached nor dyed and is traceable from raw material to retail store. We blend this unique fiber with virgin organic cotton in the Men's Reclaimed Cotton Hoody and Women's Reclaimed Cotton Crew.